Motorboat & Yachting: The amphibious RIB manufacturer has launched its largest model to date, which has been named the Sealegs 9000. 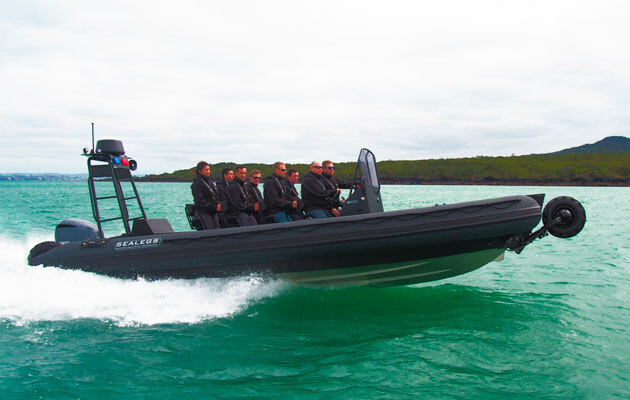 The market for amphibious RIBs is getting bigger, quite literally, following the latest launch from New Zealand yard Sealegs. The Sealegs 9000 is the largest model of its kind, with seating for eight on board its 9m (30ft) aluminium hull. And although it is targeted at commercial and military owners, pleasure boaters will surely be drawn to the idea of a 44-knot speed machine that can also crawl up the beach at a little over 4mph. This is made possible by a dual propulsion system: 300hp of Yamaha outboard power for the water and 22hp of Honda hydraulic power for the land. David McKee Wright, CEO of Sealegs, said: “The Interceptor 9000 gives us a model with the size, passenger count and layout that many commercial and military operators have been asking for in an amphibious craft. The Sealegs 9000 will go on public display for the first time next week at the Auckland-on-the-water Boat Show (September 24-27). And while the new arrival will not be available in the UK for quite some time, its smaller siblings are available through Salterns Brokerage in Poole.